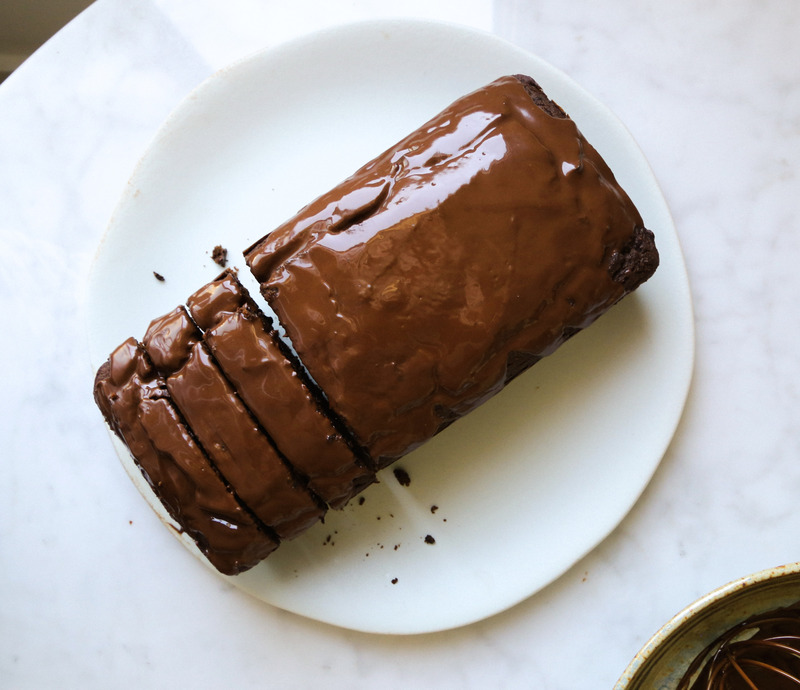 Squash is the secret ingredient in this Triple Chocolate Kabocha Loaf Cake. It adds a natural sweetness and perfect moisture to this grain-free cake. This recipe really is a chocolate-y treat that should not be missed! I strive to develop recipes that use seasonal ingredients. There is no better way to feel in touch with nature than by enjoying the fruits of the harvest. Fall is all about winter squash! There’s plenty to explore such as hubbard, sweet dumpling, delicata, and sweet pumpkin. Each variety of squash has its own special flavour, textures, and ideal use. My favourite squash is the Kabocha. Kabocha, is the Japanese word for squash, and often referred to as Japanese pumpkin. For those who know me well, know I love all things Japanese, so it’s a fitting favourite. I love kabocha because it has a dense yet fluffy interior with a nutty & perfectly sweet taste. Purchasing an actual kabocha squash can be tricky because it looks VERY similar to Buttercup. Kabocha is superior to buttercup because it’s sweeter, more flavourful, and vibrant in colour. Often grocery stores don’t even know which one is which. I often find buttercup labeled as kabocha and vice versa. A kabocha squash can either be green, like buttercup, or red. Also, a kabocha squash is usually more round, while a buttercup is more squat. However, the best way to distinguish the difference is the kabocha squash bottom points out and a buttercup bottom points in with a circular ridge. Alas, if finding a true kabocha proves to be difficult, don’t worry, buttercup will work wonderfully in this recipe. UPDATE: December 14, 2017- I substituted kabocha puree with 1 cup of canned pumpkin puree and it turned out nicely. Preheat the oven to 400°F. Slice the squash into 4 wedges and discard seeds. Bake until very tender, about 40 minutes. Cool completely. Scrape flesh from skin and puree until smooth. Measure 1 cup of puree for recipe use. Preheat again or keep oven at 350° F. Grease and line two sides of loaf pan with parchment paper allowing overhang for handles. In a large bowl whisk together the dry ingredients: flours, cocoa powder, baking powder, baking soda, and salt. In another large bowl whisk together all the wet ingredients: squash puree, coconut oil, coconut sugar, eggs, and vanilla extract. Pour the dry ingredients into the wet and whisk until combined. Fold in the chopped chocolate. Pour batter into prepared loaf pan and smooth top with a spatula or back of a spoon. Bake for 50-60 minutes, or when a toothpick inserted in the middle comes out clean. Cool in pan for 15 minutes. Remove cake from pan and allow to cool completely on a cooling rack. When cake is room temperature, begin the glaze. Place a sheet of parchment paper under cooling rack to catch chocolate drippings. Using the double boiler method, bring a small pot with 1-2 inches of water to a simmer. In a small bowl that can sit on top of the pot, combine the chocolate and coconut oil. Place bowl on top of pot and whisk until chocolate mixture is melted and smooth. Allow glaze to cool down and thicken slightly. Wipe the bottom of the bowl to ensure no water gets into the chocolate. Pour glaze all over cake. Place glazed cake in fridge for 30 minutes or until glaze has set. This entry was posted in Dessert and tagged Autumn, cake, chocolate, chocolate cake, dessert, fall, gluten-free, grain-free, local, paleo, seasonal. Bookmark the permalink.